Many reports have focused on the rapid pace of price appreciation and sales volumes of luxury homes valued more than $1 million. Year to date, sales of homes with prices exceeding $1 million account for more than 18 percent of all single family home sales in DC. With sales of $1 million becoming more and more “commonplace”, it may be time to set the bar higher in terms of what constitutes luxury. This redefinition would also better align the DC market with other expensive housing markets in the nation where $1 million no longer carries the same cachet and exclusivity that it did ten years ago. The share of overall sales of single family homes valued more than $1 million has risen from only 3 percent of all home sales in 2001 to over 18 percent in 2015. Sales of homes valued more than $1 million broke the ten percent barrier of overall sales in 2006. Sales of homes valued more than $2 million now account for more than 4 percent of all sales. Given the upward trend in prices, it may not be too long before 5 percent of all homes sold in the District top $2.0 million. Shown below are the main neighborhoods where the majority of transactions valued more than $2 million has occurred. In most of these neighborhoods, and in particular the bellwether neighborhood of Georgetown, sales of homes valued more than $2 million jumped beginning in 2014. Georgetown accounts for almost one-third of all single family homes sold valued more than $2 million. Altogether, the neighborhoods shown above account for almost 75 percent of all sales valued $2 million and over. What exactly is the data? 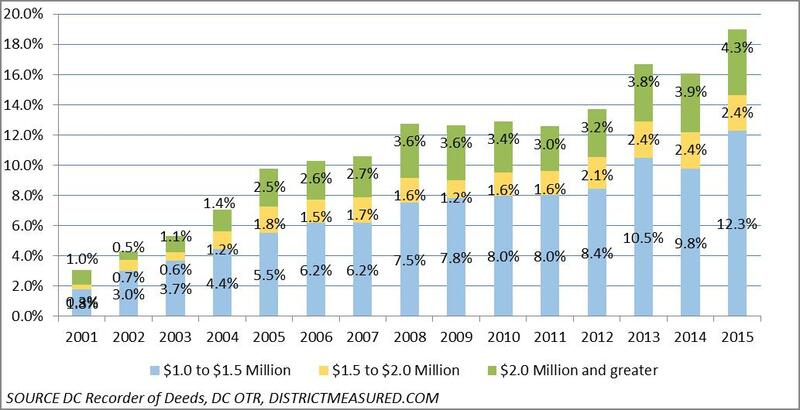 Data on sales is from the DC Recorder of Deeds and the DC Office of Tax and Revenue. Building codes 11-13 were used to identify single family homes. Only arm’s length transactions were considered.